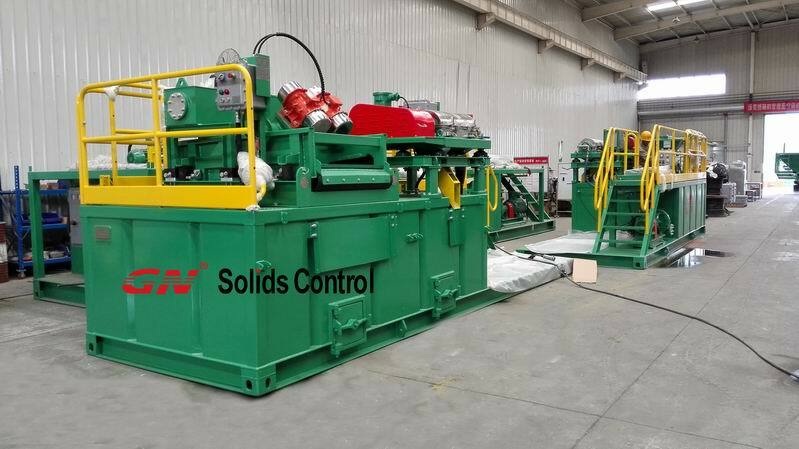 GN Solids Control is the 1st one manufacturer in China who ever sent the drilling cuttings solidification unit to client’s jobsite. 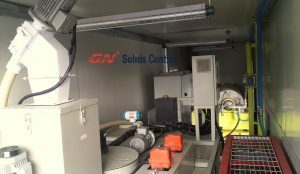 It was predictable that many comments regarding the performance of GN solidification unit would come back. More important is how to response to these comments. 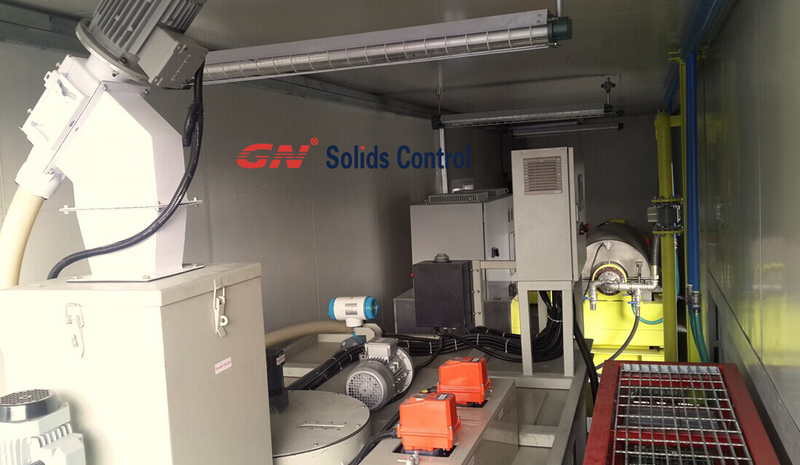 GN is always keeping developing new products, which is the reason of the first unit drilling cutting solidification unit coming from GN. Some of the comments on GN solidification unit are positive, while some are very good suggestions for GN to perfect the design. 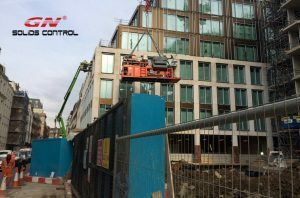 The unit sent to site was designed whole assembly installed on one skid, which makes the unit too long to move and locate the unit easily. 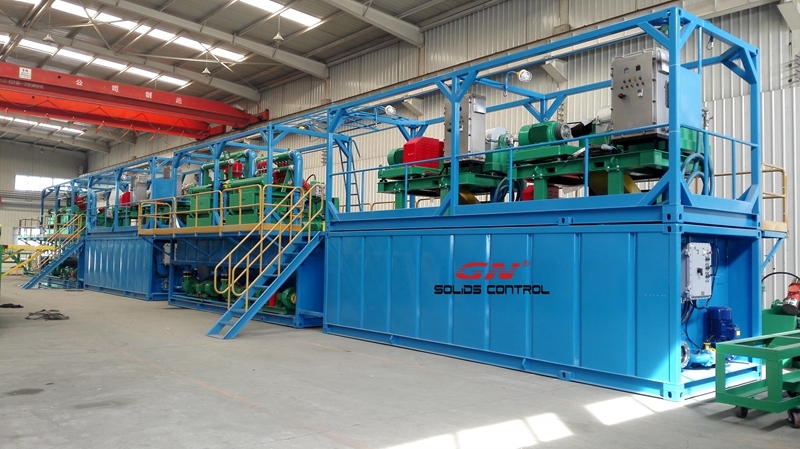 The new design divides the machine into 2 parts; one is for solidification agent storage, the other part is for mixing. These 2 parts could be located more freely according to the site space. Comparing with old model, the new one has larger tank for agent storage, on top of the tank, hand rails are installed. 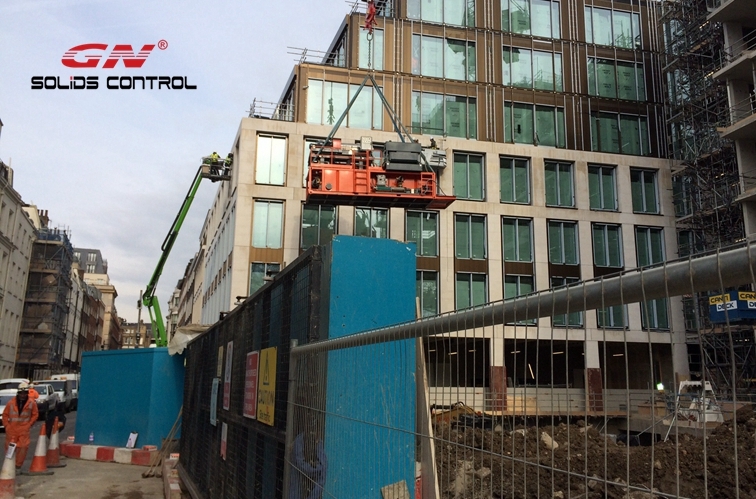 The agent bag pallet could be put on top of the tank, which greatly increases the working efficiency. Though 2 parts, the whole system still could be put into one 40ft container for oversea transportation. 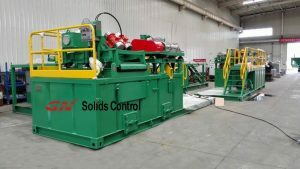 The drilling cutting discharged out of the shale shaker and decanter centrifuge could be fed into the solidification unit for treatment. 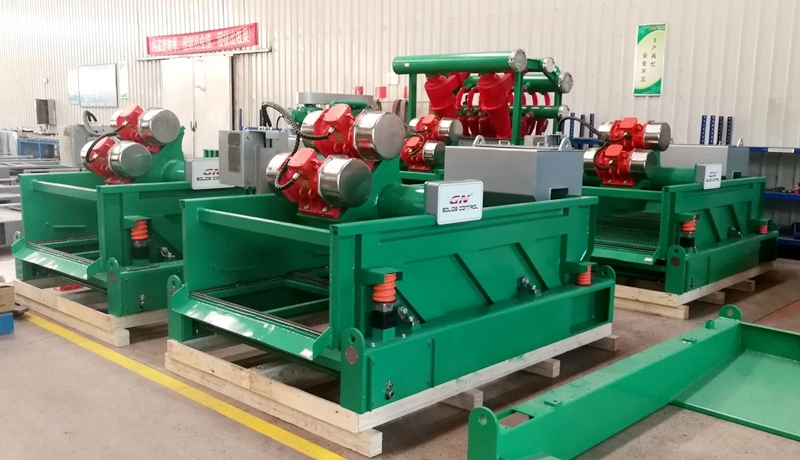 However, there is a misunderstanding on the performance of the solidification unit: No matter how wet the cutting is, so long it is fed into the solidification unit; the dry material will come out. This is not correct. The much wet the cutting is, the more solidification agent will be used. Hence, the operator should make the cutting as dry as possible before feeding into the solidification unit. 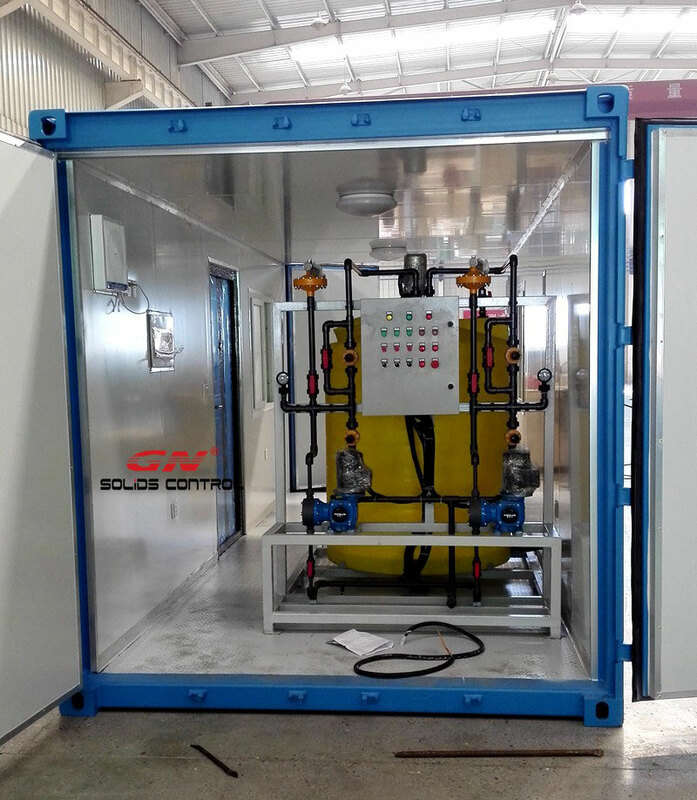 GN’s solidification unit was proved greatly saved the man power on site as it can working continuously, the speed could also be adjusted as per the working condition. 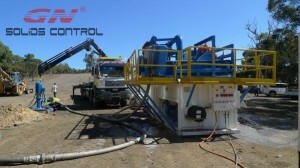 Solidification unit is one of the final solutions for water base drilling cuttings. Easy operation and maintenance are its advantages. 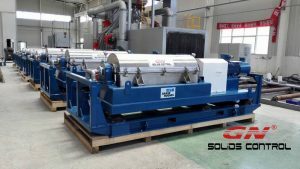 To be a professional manufacturer for solids control equipment, GN has nearly 10 years experience on decanter centrifuge research and fabrication. With these years development, GN decanter centrifuge have been supplied to the many giants in the oilfield industry. Subsidiary company of Halliburton, Baker Hughes, COSL and some other world famous company tried GN decanter centrifuges and gave good remarks. A company has to keep improving if he wants to live for a long time. GN is an example for continuously upgrading the existing equipment and developing the new products according to the market feedback. At the beginning of foundation of GN Solids, GN only made middle speed decanter centrifuge that can only be used in normal drilling fluids recycling system, like barite recover process and some high speed unit could be used in fine solids separation. The middle speed model and high speed model will be kept in the same one mud recycling system. Thanks to the many kind clients’ feedback and valuable suggestions, the only thing GN did in the past years was to perfect the design of the centrifuge and improve the quality. 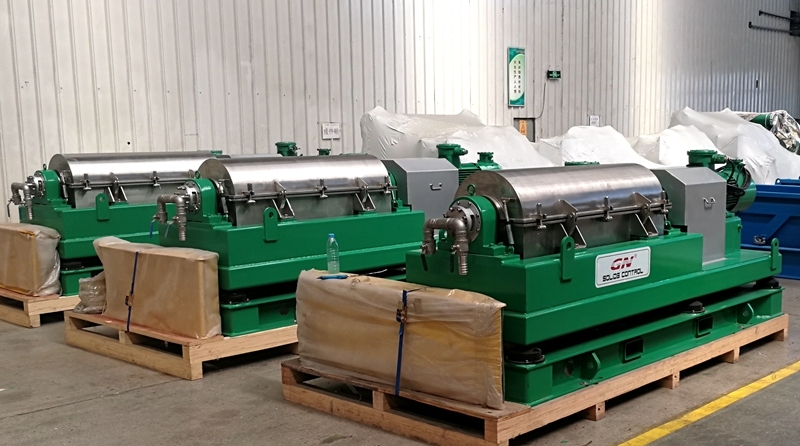 Nowadays, GN’s 4th generation decanter centrifuge is under design processing. The best seller of GN C version decanter centrifuge could be electric controlled as fixed speed or variable speed. 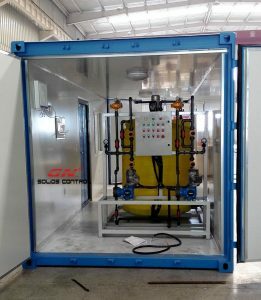 The PLC design high standard positive pressurized control cabinet is available. Top quality centrifuge bowl material duplex SS2205, optimized feeding direction and high standard material for solids discharge touching parts make GN decanter centrifuge could be adopted in waste cuttings management system, drilling fluids de-watering system, and crude oil tank bottom sludge cleaning out of solids control system. 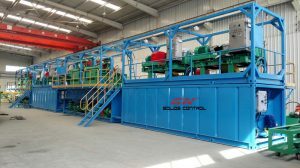 In the past two years of winter of oil business, it was widely application of GN’s decanter centrifuge that brought GN many orders which kept GN alive, even became bigger than ever before. GN’s second facility close to HQ will be launched into use very soon. This facility is specialized used to develop centrifuges. Most industries could be a GN’s future market like the sewage treatment, environmental projects and food industry. Actually, it is because many inquiries coming from these industries, which urges GN to expand into these areas. Where there is a request, there is a market. 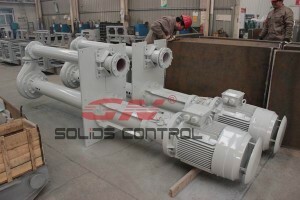 In drilling mud solids control system, pumps are used to transfer the drilling fluids from one machine to another. Submersible slurry pump is one type pump installed vertically on mud tank or mud pit. 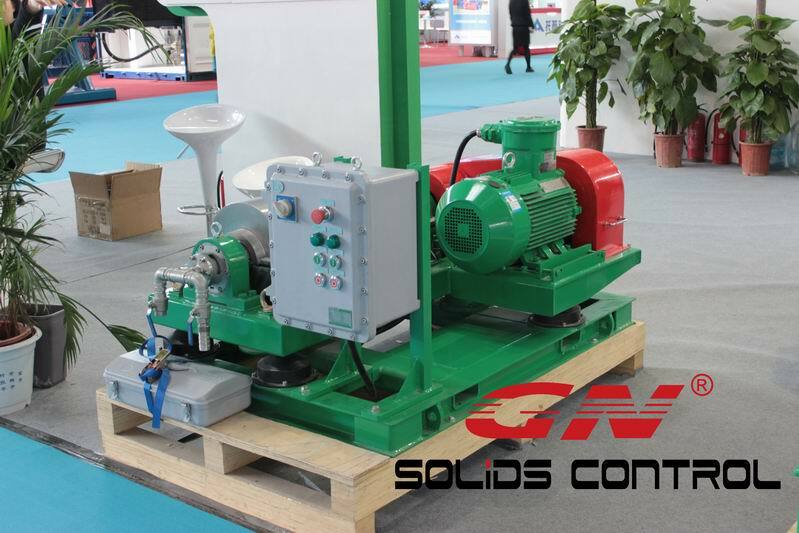 In GN designed solids control system, this type slurry pump is often used in HDD project and feeding to centrifuge wherever it is used. 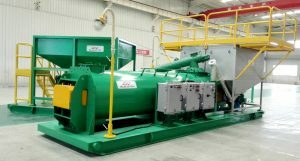 GN has standard model of HDD mud system ranging from 200GPM to 1500GPM. All the models are compact structure. The used drilling fluid in this horizontal drilling comes out from the drilling hole and accumulates in a mud pit. It requests a pump to transfer the drilling mud to the mud system. Above picture perfectly shows the how the submersible slurry pump is installed vertically on the mud pit to transfer the drilling mud to the shale shaker in the HDD mud system. As this pump is installed out of the mud system, when making the quote to clients, GN always recommends an independent submersible slurry pump as an option. In an oil and gas drilling mud system, after treated by the de-silter cyclone, the drilling mud will be pumped to decanter centrifuge for fine solids separation. Vertically installed in mud tank will ensure a larger tank compartment capacity for more drilling mud storage. GN’s submersible slurry pump is single stage single suction type pump that is usually used to transfer the slurry with larger solids content. There is no bearing and gland seal between impeller and pump body; hence the slurry pump is maintenance-free and high temperature resistance. 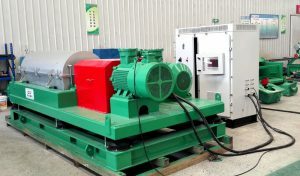 Submersible slurry pump is an ideal equipment to transfer the mud to centrifuge and HDD shale shaker. Besides, it can also be used to feed the de-sander and de-silter.